Fighting for Acceptance - The first ever socio-political book examining the sport of Mixed Martial Arts. Rarely does an author take time to explore the various angles of a sport from the athletes' perspective. Dave did a great job giving a clear picture of today's MMA athletes, from what motivates them as a whole to how they view themselves. It is an interesting and easy read for both the fan and the critic. Every fighter needs to read this book. If you want to have a future in MMA and know all the issues that MMA fighters deal with, you should read Fighting for Acceptance immediately. 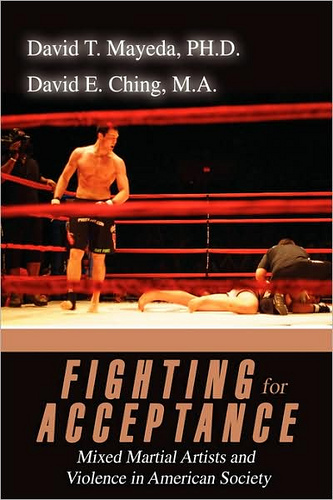 Dr. Dave Mayeda's ground breaking book Fighting For Acceptance is a triumph and a must read! The Mixed Martial Arts phenomenon has exploded into the mainstream media with such tremendous force, that only a few men have paused to reflect on our responsibilities as spectators, promoters, and practitioners of this sport. In this book, Dave fearlessly tackles a wide range of sociological issues. 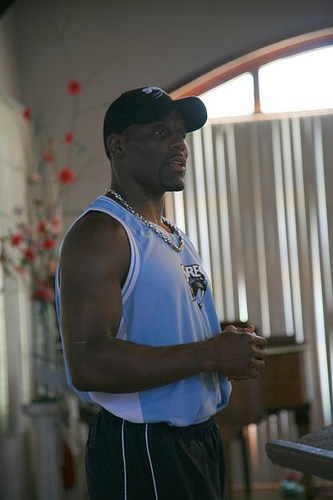 He succeeds in both educating the public of MMA, while also demanding excellence and accountability from all those involved. Fighting for Acceptance is a bold and insightful look at MMA and its impact on society. Pick it up at Fighter's Corner today! 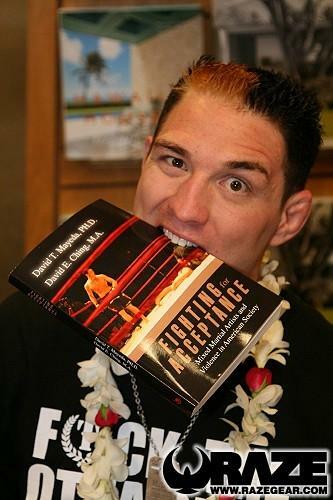 Click HERE to read book reviews of Fighting for Acceptance over at MSNBC.com, MMAJunkie.com, Sherdog.com, Xtreme Lifestyle Magazine, 411Mania.com, DCTaekwondo.com, and InsideFighting.com. Listen to Luke Thomas, Editor of BloodyElbow.com and host of the Washington DC radio show MMANation, talk with Dr. Mayeda by clicking HERE. Luke read Fighting for Acceptance thoroughly before the interview, so it's a really good conversation (from 8/9/08; a few minutes into the show's segment). Listen to MMA expert Mauro Ranallo talk with David Mayeda about MMA as it compares safety-wise to football, basketball, and soccer, media portrayals of MMA, and Fighting for Acceptance by clicking HERE. A fun and interesting discussion (from 12/12/08; 26 minutes into the show - fast forwarding available). 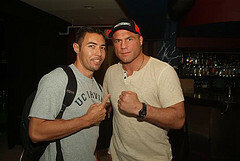 Jonathan Stamey talks with David Mayeda about the social ramifications of fighters making the fight more about violence than skill, and if MMA is indeed safer than boxing. Click HERE to navigate to the podcast (from 4/29/09). Pramit Mohapatra and Brian Furby talk with David Mayeda about Dana White's use of homophobic hate speech directed at Sherdog.com reporter Loretta Hunt. 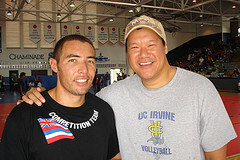 Also on the show, Strikeforce CEO, Scott Coker. Click HERE to navigate to the podcast (from 4/2/09). Feel the pain and hear the vivid voices as mixed martial artists discuss what it's like to be involved in America's fastest-growing sport. Who are the ultimate fighters? How did they become involved in the sport? What goes on in their heads while competing? Do MMA fighters feel a social responsibility to preach nonviolence out of the sport? What safety measures are needed to protect MMA fighters? How do MMA competitors see themselves fitting into today's society? 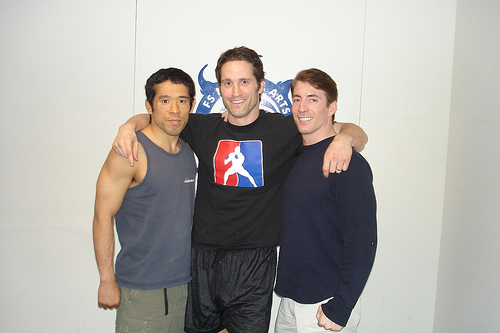 Authors David Mayeda, Ph.D. and David Ching, M.A. explore these political and sociological issues through in-depth interviews with forty MMA fighters such as Randy 'The Natural' Couture, Quinton 'Rampage' Jackson, 'Dangerous' Dan Henderson, Jason 'MayheM' Miller, Antonio McKee, Frank 'Twinkle Toes' Trigg, Travis Lutter, Chris 'The Crippler' Leben, Guy Mezger, Savant Young, and Chris and Mike Onzuka. Where can you get the latest MMA news? Right here! Read the Fighting for Acceptance FORWARD, written by Jason 'Mayhem' Miller. Click HERE to see a complete list of all 40 interviewees. Want to know about the authors? Click HERE. 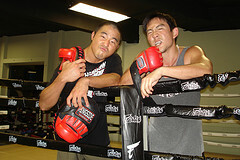 Interviewees Steven 'The Soul Samurai' Saito and Nolan Hong urge you to check out the Fighting for Acceptance Chapters by clicking HERE. We have a lot of people to thank for helping us make Fighting for Acceptance happen. Click HERE so we may say Mahalo. This book can only be purchased online ($19.95 plus shipping and handling). It is NOT an online book. It's a normal book, but you must purchase/order it over the net. You can now purchase Fighting for Acceptance by clicking here: , at BARNES&NOBLE.COM, or AMAZON.com. (As an 'on demand' book, Fighting for Acceptance can only be purchased online through the net). 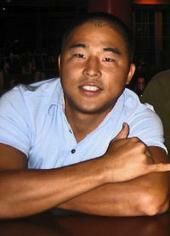 Watch the online documentary "MMA 808: Inside Hawaii's Fight Game" that emerged from this book by clicking HERE. Although we did not interview Tim Sylvia, his commments here in this short YouTube video reflect the exact kind of message we are trying to get across through our book. Kudos Tim. Have something to tell us? Either e-mail us at mmacademics@yahoo.com, or write a response to one of our MMA advocacy pieces Fighting for Acceptance MMA Advocacy.